The Local Configuration Manager (also known as Local Manager) is an embedded service for handling the configuration of SFTPPlus. It looks and behaves like a regular web application and works in any modern web browser. The configuration options are detailed in the Local Manager Configuration page. The Local Manager comes with a default administration account with username admin and password pass. For security reasons, you must change this. Details are in this dedicated section. While using the Local Manager graphical user interface, you have access to integrated documentation, assistance, and validation which will guide you through the configuration process. 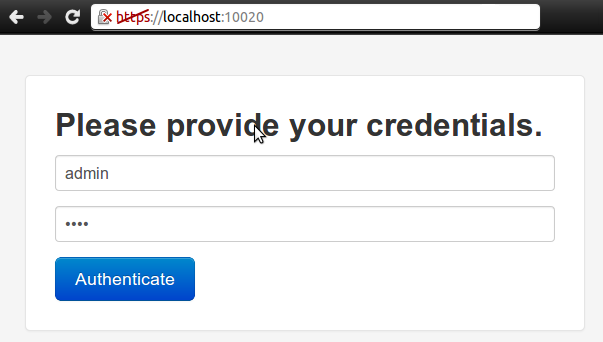 Configure the Local Manager itself. Add / remove / configure file transfer services with all supported protocols. Add / remove / configure local manager services. Add / remove / modify administrators, roles, accounts, groups etc. View audit trail / log entries stored in a database. Read and search these documentation pages. Convert SSH Keys from and to OpenSSH, SSH.com, Putty, etc format. When applying changes from Local Manager, there might be a delay of 0.5 seconds until the changes are actually applied. When removing a component which is already running, from within the Local Manager, it will stop automatically. See below for an example of an error arising from an invalid SSL Cipher List configuration for a service. Hovering over a Failed at start state can also show the administrator further details of the issue to help troubleshoot the problem. 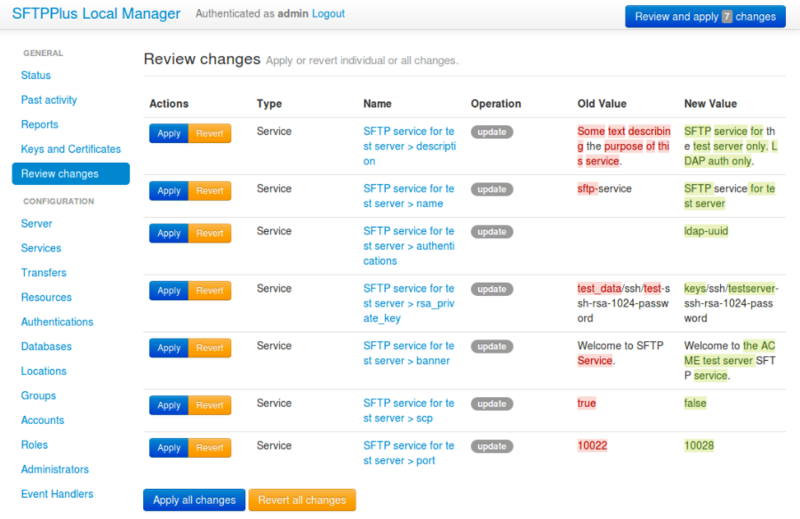 Prior to applying changes, administrators have the option of reviewing their changes. Some of these changes will require restarting the affected, changed or updated components. Minimum screen resolution requirement: 1024 x 768. For security reasons, you cannot restart the whole server from within the Local Manager, but you can restart or reload separate services such as SFTP or FTP services, including the Local Manager service itself. Change protocol type for an existing service. Change account type for an existing account. Disable or stop the main local manager service itself. This can only be done by manually editing the configuration file. When stopping a service, the Local Manager only prevents the service from accepting new connections. Connections that are already established continue to function until they are terminated in a normal way and active clients are not forced to disconnect. For performance reasons, the Local Manager service uses minimized CSS and JS files and instructs the local browser to cache CSS, JS and other resource files. In order to make it easier to investigate support issues or audit web requests made by the Local Manager, we provide a development mode . When running in development mode , the Local Manager will force the browser to always reload CSS and JS files while using un-minimized CSS and JS files. This mode might come in handy if you experience caching problems, or you want to audit Local Manager code. Also, experimental features are only visible in Local Manager when the development mode is enabled. where host and port should match your configuration. If you are already on the https://host:port page, amending the URL will not automatically reload the page. In this case, refresh the page after amending the URL to force the browser to process the request. Enabling the development mode is triggered by a hidden control, but disabling it is much easier. After successfully logging in to the Local Manager, check the page footer. You should see a link to disable the development mode. Clicking the link will disable the development mode and will reload the page.